With the creation of a competitive environment, comes the opportunity for a "win at all costs" mentality to emerge. This win at all costs thinking supports a culture where the values of CSL, its member organizations and the stakeholders, are compromised by the drive to win. The No Victory Without Honor® Program allows everyone to compete and experience the game in an environment that remains true to the shared values of the league, the clubs and all stakeholders. We ask every team to sign up for the NVWH Program and show your commitment to working together to make CSL not only one of the most competitive leagues in the country but also the most enjoyable. 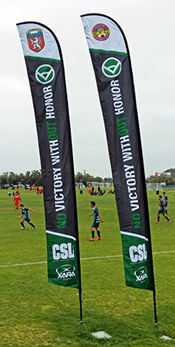 Upon the completion of your season, your team will receive an 11 foot tall NVWH Flag and Flag Stand with your club logo printed on the top of the flag as long as your team has NOT violated any one of the CSL STANDARDS FOR SUCCESS. The Flag will be delivered to your team at the end of January 2018.